LCS 9, the future USS Little Rock, underway on Lake Michigan during Builder’s Sea Trials on Aug. 12. LCS 9 is scheduled to be delivered to the U.S. Navy later this year following Acceptance Trials. The Lockheed Martin-led industry team successfully completed the future USS Little Rock’s (LCS 9) Builder’s Trials on Aug. 17, 2017. 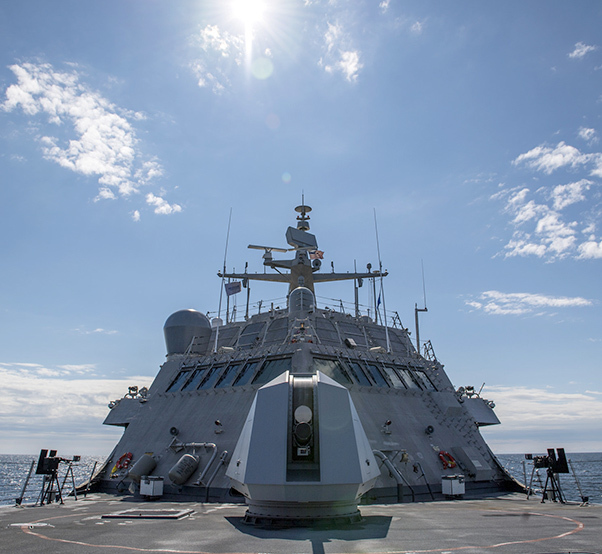 The ship’s sea trials were completed in Lake Michigan after a successful set of demonstrations which saw the fifth LCS 9 hit speeds over 40 knots. Sea trials are designed to test the ship’s performance under a variety of operating conditions. 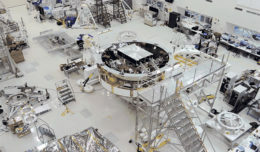 During the builder’s trials, the industry team successfully demonstrated reliability and performance improvements on the ship’s propulsion system. All future Freedom-variant Littoral Combat Ships will incorporate these improvements. The Lockheed Martin-led team is now preparing Little Rock for acceptance trials in the coming weeks, when the U.S. Navy’s Board of Inspection and Survey (INSURV) will conduct inspections and witness final demonstrations before the ship is delivered to the Navy this year. Named in honor of the patriotic and hardworking citizens of Little Rock, LCS 9 will be the second U.S. Navy ship to bear the name of Arkansas’ largest city. The Lockheed Martin-led industry team is currently in full-rate production of the Freedom-variant of the LCS, and has delivered four ships to the U.S. Navy to date. The future USS Little Rock is one of eight ships in various stages of construction at Fincantieri Marinette Marine, with one more in long-lead production. 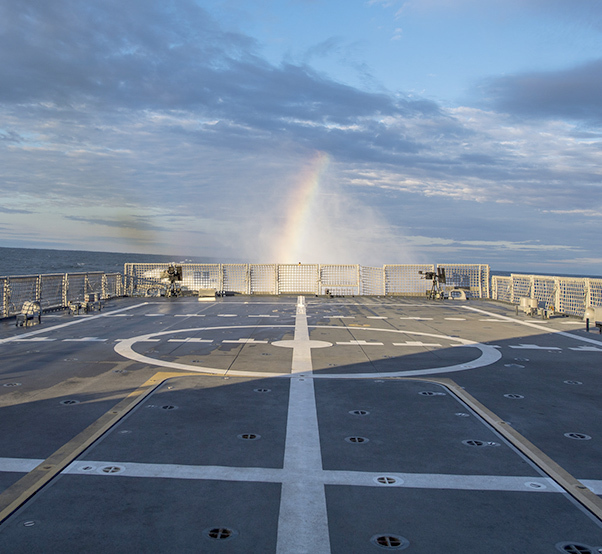 A rainbow is visible in LCS 9’s “rooster tail” during Builder’s Sea Trials on Lake Michigan. At top speed, LCS 9’s four water jets move approximately 2 million gallons of water per minute producing a 30-foot wall of water known as a rooster tail. That’s enough water to fill an Olympic swimming pool in 20 seconds. The team is on track to complete sea trials for LCS 9 and LCS 11 this year and deliver each ship shortly thereafter. The remaining hulls under contract will be delivered to the U.S. Navy at a rate of two ships per year. The Lockheed Martin-led LCS team is comprised of shipbuilder Fincantieri Marinette Marine, naval architect Gibbs & Cox, and more than 800 suppliers in 42 states. Costing less than a third of a brand new Arleigh Burke-class destroyer, the Littoral Combat Ship is the Navy’s most affordable surface combatant shipbuilding program and the ideal platform to grow the U.S. Navy fleet quickly and affordably.